Bollywood actress Kriti Sanon left the Bangalore crowd stunned with her sizzling performance during the Indian Premier League match between Royal Challengers Bangalore and Delhi Daredevils at M. Chinnaswamy Stadium on April 8. Kriti, who grabbed the limelight after appearing in Sabbir Khan’s directorial romantic action drama ‘Heropanti’ opposite Tiger Shroff, enthralled the crowd with her performance on the song ‘Mera Naal Tu Whistle Baja’ from Heropanti. This is for the first time in the history that the IPL organisers have decided to provide some glamour quotient before the beginning of the first match in all the venues. Kriti was last seen in Rohit Shetty’s directorial “Dilwale’ which also featured superstar Shah Rukh Khan, Varun Dhawan, Kajol and others. Produced by Gauri Khan, Dilwale managed to grossed over Rs 372 crore (US$55 million) worldwide. The actress will next feature in Dinesh Vijan’s directorial ‘Raabta’. The film also features ‘MS Dhoni- The Untold Story’ fame actor Sushant Singh Rajput. The film is slated to release on 9 June 2017. 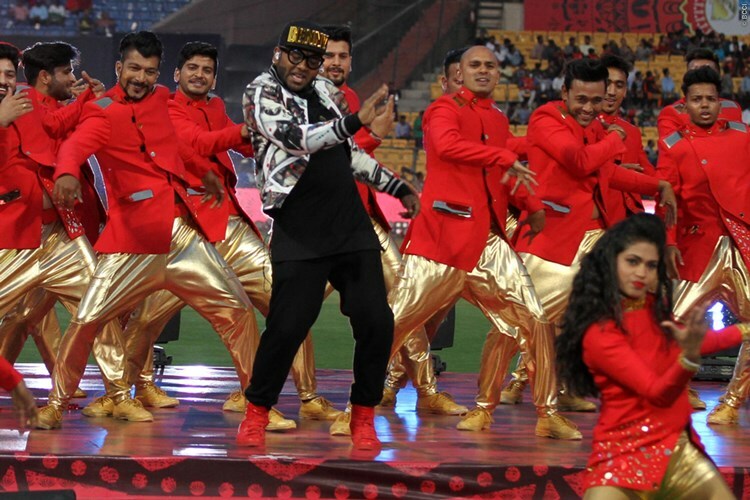 Besides Kriti, Bollywood singer Benny Dayal to enthralled the crowd with some of his songs. Benny is famous for songs like ‘Pappu Can’t Dance Sala’from the movie ‘Jaane Tu… Ya Jaane Na’, ‘Badtameez Dil’ from the film ‘Yeh Jawaani Hai Deewani’ and ‘Ude Dil Befikre’ from the film ‘Befikre’ among others. Benny for crooning the song ‘Kaise Mujhe Tum’ from the film Ghajini got the 54th Filmfare Awards – RD Burman Award for New Music Talent. Earlier, Royal Challengers Bangalore (RCB) captain Shane Watson won the toss and decided to bat against Delhi Daredevils (DD). RCB: Chris Gayle, Mandeep Singh, Vishnu Vinod, Kedar Jadhav (wicketkeeper), Shane Watson (captain), Stuart Binny, Pawan Negi, Iqbal Abdulla, Tymal Mills, Yuzvendra Chahal, Billy Stanlake. DD: Sam Billings, Aditya Tare, Sanju Samson, Karun Nair, Rishabh Pant (wicketkeeper), Carlos Brathwaite, Chris Morris, Pat Cummins, Shahbaz Nadeem, Zaheer Khan (captain), Amit Mishra.